Is Skype for Business worth the hype? 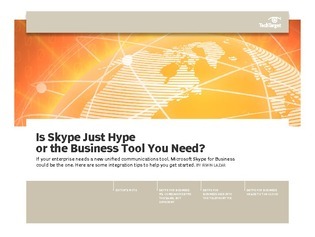 Is Skype Just Hype or the Business Tool You Need? Microsoft's recent rebranding of Lync to Skype for Business (SFB) is creating some confusion for IT leaders seeking to distinguish it from the consumer Skype service, as they also look to integrate voice capabilities of SFB with their existing telephony platforms. This three-part guide covers all the latest information on Microsoft Skype for Business. You will gain a comprehensive understanding around Skype for Business and how it differs from Microsoft Lync issues around integrating Skype for Business, and how cloud computing fit in with skype for business.